Last Sunday, we went to see Chemical Brothers at Hollywood Bowl! This time, I made everything which can be eaten by hand. The main dish was oven-roasted Asian-style Spicy Yakitori (skewered chicken). It came out so juicy and nice! 1. Put all the ingredients except for the chicken in the food processor and puree into sauce. 2. Marinade the chicken in the sauce for 2-3 hours. 3. 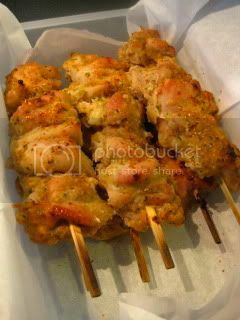 Skewer the marinated chicken and bake in the 400F oven for 12-13 minutes. 4. Finish under the broiler for 3-5 minutes or until the surface is nice brown and chicken is cooked through. 5. Serve with some sprinkles of sansho pepper and ichimi pepper (optional). 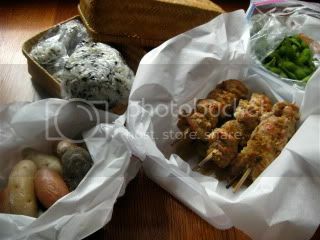 Our picnic food...yakitori, onigiri (rice balls), salt-roasted donabe fingerling potatoes (click here for the recipe), and edamame. 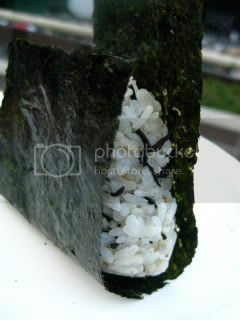 Onigiri was hijiki seaweed and sesame seeds. The rice was so fluffy and tasty even after 3 hours because it was cooked with the double-lid donabe rice cooker, "Kamado-san"!